Is Indoor Air Quality a Concern? You Bet It Is! Many people have allergic reactions to pollen, bacteria, dust mites, and animal dander. Alergies including hayfever and asthma affect 41 million Americans or about one out of six people. 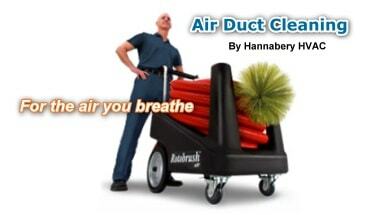 Hannabery HVAC offers Professional Air Duct Cleaning Services, provided by experienced HVAC Technicians. Call us today to schedule an appointment - 610-366-9400. Residential Only. If there is cigarette or cigar smoke, and/or pets. If ducts are infested with vermin... rodents or insects. If you have fiberglass or insulated air ducts and the insulation or duct gets wet or moldy, it cannot be effectively cleaned and should be removed and replaced. And if the conditions causing the mold growth in the first place are not corrected, mold growth will recur. A build up of 0.42 inches of dirt on a heating or cooling coil can result in a decrease in efficiency of 21% (EPA). Consumers should beware of “blow-and-go” air duct cleaning companies. These companies often charge a nominal fee and do a poor job of cleaning your duct work. These companies may also persuade the consumer to pay for unneeded services with and/or without their permission. Consumers are told they have mold and other toxic substances in their HVAC systems – claims which are most likely false and used merely to extort money. Coupons and flyers advertising rock bottom prices on “whole house air duct cleaning” and “HVAC mold and soot removal” arrive in the mail daily for some households. Just remember, you get what you pay for! 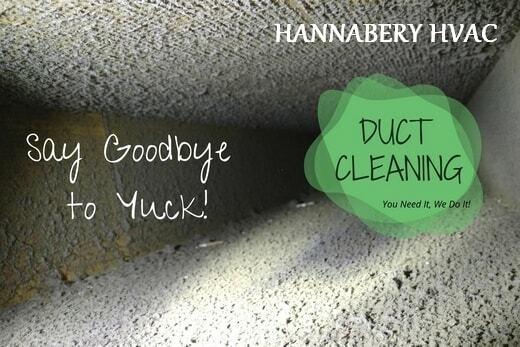 Have your Ductwork professionally cleaned today!